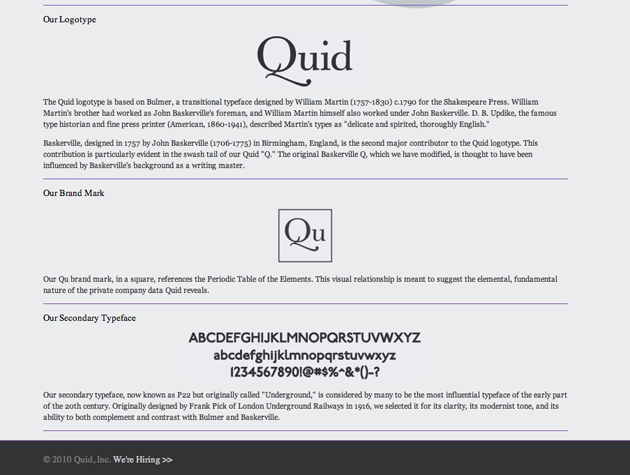 Does Quid Have The Most Pretentious Website of Any Startup Ever? First of all I literally spat out my morning coffee when I saw the header “Our Secondary Typeface.” Secondary typeface!? How about a primary business model? “Quid is from the Latin ‘quid,’ what.” What? “In law, quiddity is used to refer to a fine point, the essential difference. Shakespeare includes it in a speech by Hamlet, referring to a lawyer, “Where be his quiddities now, his quillets, his cases, his tenures.” WTF? “This contribution is particularly evident in the swash tail of our Quid ‘Q. '” Swash tail! “Our team brings backgrounds in engineering, finance, physics, computer science, biochemistry, and design to bear on this lacuna.” Lacuna! Quid recently launched in private beta and is backed by Founder’s Fund for an undisclosed amount. Oh, and I almost forgot, good news for those who have recently finished their Rhodes Scholarships in Classics/Particle Physics and are looking for a gig in between singing in an Art Rock band, learning their 16th language and joining the French Foreign Legion! Quid is hiring.